A few nights ago, Team Unwinnable shot a short film. Shortly after the fact, Ken Lucas met Geddy Lee. Geddy Lee, in all his magnificent benevolence, bestowed one super power on Ken, a power of Ken’s choosing. Ken chose Death Ray. Unfortunately, Ken was holding the video camera when Mr. Lee gave Ken his Death Ray power. The film is survived by its writer and screenplay. Enjoy. An Unwinnable Adventure at the Penny Arcade Expo. Matt lays in bed, looking distinctly hung over. The alarm clock is blasting The Foundations’ “Build Me Up, Buttercup.” Matt looks over at the alarm clock, he is not amused. 3. Putting on a blazer. 5. 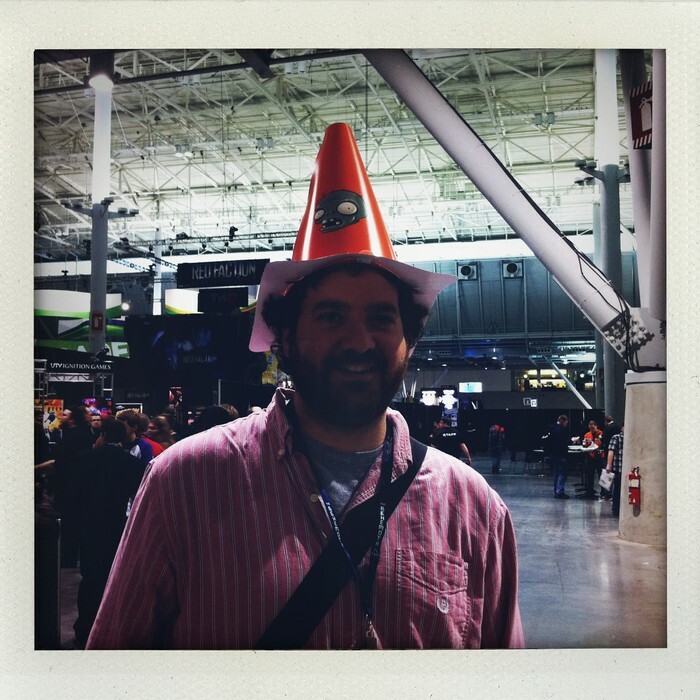 Putting on the Plants Vs. Zombies Cone hat. 6. Walking towards the convention center. Matt approaches a PAX Enforcer. Hey! I’m here for the penny arcade! Matt pulls an old mayo jar full of pennies out of his messenger bag. He looks very excited. The smiling plant is visible on his hat. You’re taking that kind of literally, aren’t you? Matt, looks crushed and walks away disappointed. The angry zombie is visible on his hat. Rock Band Gets in the Van Warping Through A Trapdoor X-Rays, Joysticks and Fatalities Oceans Away!